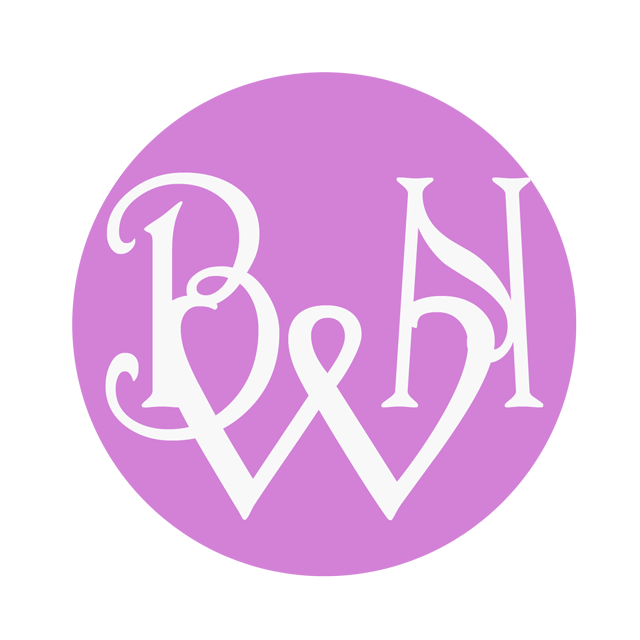 In a few days from writing this post we will be in the Lenten season. This year is very interesting though, since it also falls on Valentine’s Day. Like usual, I’m trying to think of something I want to focus on during the season of Lent. Previously, I’ve given up social media, and sugar, but like last year, I want to do something more meaningful. Last year, my Grandmother passed away on the first day of Lent, and while I was taking care of my newborn, I wasn’t able to attend the funeral. It was at home, while mourning, that I truly noticed how short the fabric of life was. On one hand, I was mourning the loss of life of my maternal grandmother, the last grand parent that I had living. On the other hand, I was nurturing this huge potential for a future: my son, whose life just began. Then there was me: between the two, at the midpoint of my life, knowing that one day, my time will come as well. 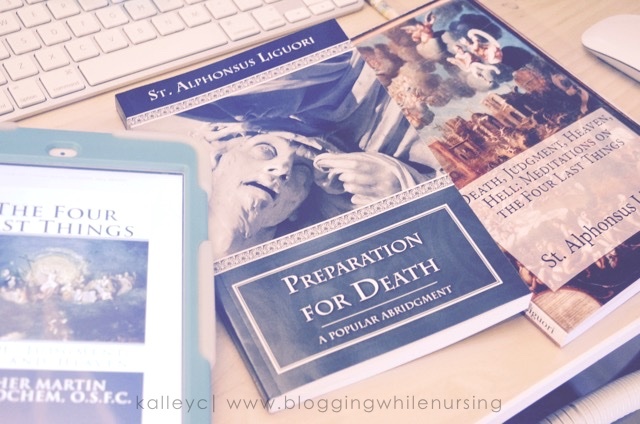 Last Lent, I decided to real some very “heavy material.” The Four Last Things–Death, Judgement, Heaven, and Hell as well as Preparation for Death. This year, I’m thinking about revisiting the books. It’s not that I think of death often, I think It’s because I don’t think of it often enough. Sometimes, we get caught up in our day-to-day lives that the idea is always lingering in the background but we never really turn to it, unless we’re forced to. We are forced to face our mortality idea when loved one or family friend passes away. What if we willing turn our attention to the purple elephant in the room? What if instead of distracting ourselves to avoid dwelling on these matters, that we willing turn our heads and look? What if we paid attention and truly took account of our lives, and what condition our souls are in? This year, like last year, I’m going to focus on these books again. I’m going to look at it head on, and tackle the thought. I don’t have any recent death in the family, but this idea comes from “death unto self.” To die unto ourselves, and be born again in the love and mercy of Our Lord. Where was Ashes in the Bible? The Lenten season starts (usually) with ashes on our forehead. The priest reminds us that, we are dust, and to dust we shall return. Now some people would say, Lent was never in the Bible, but if you read carefully, the act of dusting oneself with ashes is not a foreign idea. Here are a few scripture verses that talk about this. These are only a few verses from the Bible. The sackcloth and ashes were an outward sign of mourning, of repentance for sin. When we have ashes on our foreheads that is what we remember. 40 Days for the Whole Season? Forty days seem to have very important number in the Bible. Moses led the Israelites in the Desert for 40 years. Moses stayed and prayed at the top of Mount Sinai for forty days. After Jesus was baptized by John the Baptist, he was led into the desert to fast and pray for 40 days. We are not called enter into physically desert, but a spiritual desert. This is where we deprive ourselves of the things we that has a hold on us. To take those things away, and rely on God alone. We unit ourselves with his fasting, not to “look” better than others, but to detach ourselves from the things of this world so that we can love God more. “Remember you are dust. 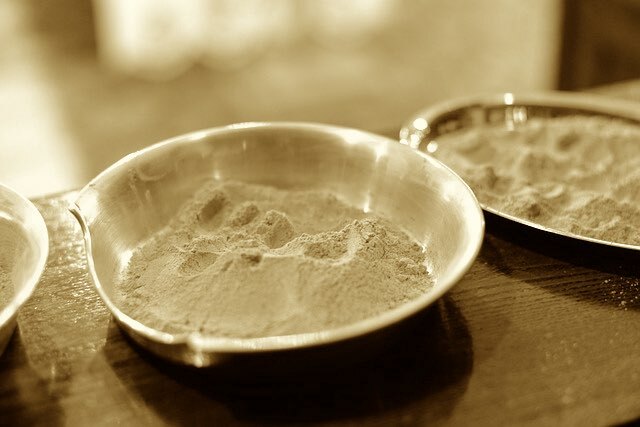 And to dust you shall return.” These are the words that the Priest says as he places ashes on our heads, and it’s a phrase that will sear into your soul. It’s not so much about death and dying, but it’s being reminded who created you. It reminds you that our destination is with Him, our creator. This time of year is my favorite because our society has us scattered brain! We go from one holiday to the next without noticing that Valentine’s Day decorations are out with Christmas, and Halloween. It’s like, pick your holiday, and shop! I don’t know about you, but that just makes me feel crazy. Could you not stand and watch with me for one hour? We meditate, while we fast from things and food that has a grip on us. We have to slow down during this time. We wean ourselves from the things that has a grip on us, and we grow in temperance (self restrain). We are performing a much-needed spiritual exercise in a time when we can be over indulgent. Hopefully when we are done with our pruning, we would have rid ourselves from Vices and grown in Virtues. Lent is our pruning season. This pruning we go through allows us to detach from the worldly things, and turn our focus back to God. It’s the greatest expression of joining your sufferings with Christ before the big celebration of Easter. This Lenten season, I know where I am starting from. Where I will end up…that’sGod’s will. I put everything in Him. I’m not only looking to wean myself away from things, but I’m looking to add better virtues to be closer with our Lord. What do you have planned this Lent? Are you giving up anything? Taking on something? I really would like to know Share your thoughts in the comment section below.